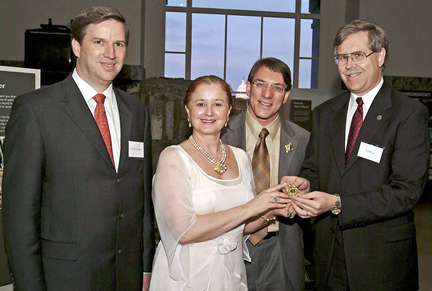 The presentation ceremony of the "George Pendant" to the Smithsonian. The presentation ceremony of the "George Pendant" to the Smithsonian was attended by Cristian Samper, the Director of the Smithsonian, Paula Crevoshay, the Artist, Martin Bell and Jeffery Post, the Curator of the National Gem and Mineral Collection. 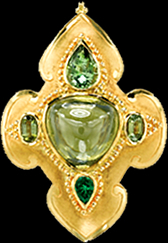 Dr. Post said "The beautiful cabochon, natural-green zircon is a stunning centerpiece in the classic Crevoshay designed "George Pendant". This wonderful gift is the first piece of zircon jewelry in the National Gem Collection and we are delighted that it is a Crevoshay jewel."